This turned out to be a really good story about the trails and tribulations that some of the youth face in today’s time. This is a book about the school jock in the closest but in love with the nerd. Instead of be brave he is cruel to him and turns the time they spent together into nothing but a bad memory. Then there is the school bad boy who is also gay but no one knows who falls inlove with the same nerd and becomes his protector from the bad. He light of the nerds life. His best friend. And his love. Scotty in my opinion is just trying to make it till the end of his high school days in one piece. It is like he has so many different people coming at him from different directions he does not know which way to turn. Vincent has got to be my favorite character in the book. He acts bed but really he is a good guy. He is strong from all that life has thrown at him and he is not scared to take a risk with Scotty. But he is scared of being betrayed. These two really do make an awesome couple and once they learn to communicate they are really an amazing couple that will probably make it a long way together. As I said this a book about young adults finding their way the best they know how. With all the bumps along the way. This is a sweet YA story. There is so much drama that you can’t help but laugh and remember high school. Despite them calling their school college, I still felt that they were high schoolers in maturity. Scotty and Olive and the fearsome twosome – they would die for each other and protect each other with such a fierceness that you don’t think anything will ever change their relationship. Then you have the dynamic between Scotty and his nemesis, Taylor. I really disliked Taylor and his evil ways. However, throughout the story, you’re able to see Taylor evolve in to something other than the mean, immature, moronic teen that he started as. I liked that Jerams showed a very clear progression of Taylor maturing. That being said, in the end, the reader was able to know Taylor really well and I appreciated that his story wasn’t left behind. Yes, it was secondary, but without it, this story would not have been as good as it was. Vincent is another enigma in this story. He is dangerous, mysterious, sad, broody and the all around high school bad boy. He’s a guitar player, singer, friend adn confidant. However, he is also still, just in high school and thus prone to stupidity just like everyone else. His sidekick is somewhat scary and I picture her more as a goth than what she’s described as. She’s also scary and a little possessive, but has a very fierce devotion to Vincent, just like Olive and Scotty’s relationship. Throughout the story, I was constantly thinking, “this is it, the secret is going to come out now” or “come on Scotty! Grow a pair!!!”. It was frustrating, sweet, sad and emotional, but in the end, it was just the story that was meant to be told. I really enjoyed it. It was a coming of age, accepting who you are, leaning to love and all the other things that come with growing up and going through high school. Becky Jerams (born June 26th, 1987) is a writer and musician from Portsmouth, UK. 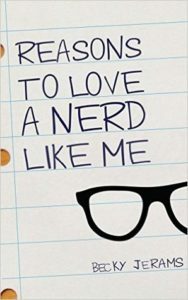 Reasons To Love A Nerd Like Me is her debut novel and has been featured on the website Wattpad where it has gained many loyal readers and over two million hits. After receiving such an overwhelming response for her writing, she recently released the new and improved edition of her story as an official eBook through Kindle Direct Publishing. She lives with her boyfriend in a little flat near the sea and splits her time between fiction writing, songwriting sessions, performing acoustic gigs and working in a student art shop. Her songs have been featured internationally on various shows and adverts, and her stories have been read by thousands of young people across the world gaining her fans from UK, US, Spain, Philippines, Nigeria, France, Egypt, Jamaica, Australia, India and beyond. Her pacey, emotional style of writing aimed for a young adult audience has been compared to the likes of John Green, David Levithan and Jenny Downham. Becky is currently working on the spin-off sequel to Reasons To Love A Nerd Like Me titled Could You Love An Apple? which will be available on Kindle in the near future. She hopes to continue writing about the characters she has created for as long as people want to keep reading about them.